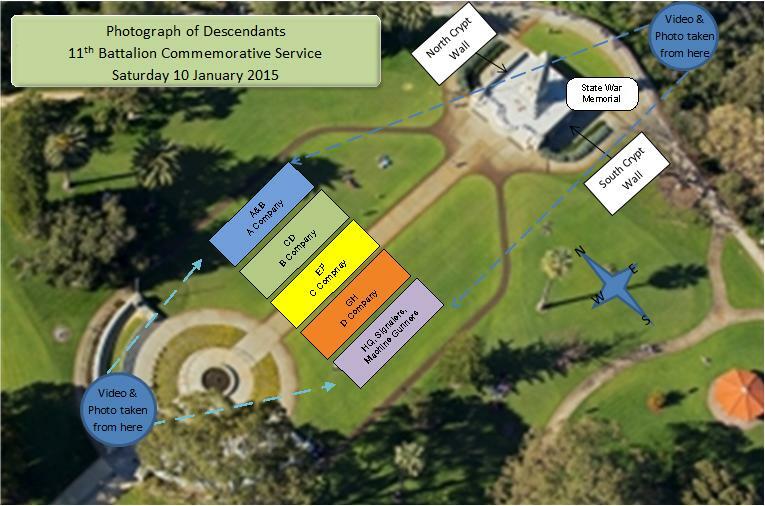 We hope you can join us for the 11th Battalion Centenary Commemorative Service at the Flame of Remembrance, Perth War Memorial, Kings Park, Perth, Western Australia on 10 January 2015. The service is open to all and will commence at 09:00am and finish at approximately 10:30am. This event is for any 11Bn soldier, not just those in the Cheops photo. Of the many thousand heroes who did not get the cross? J. H. Barnes "My Brother's Son" - Globe Theatre, Sept. 9, 1915. Descendants/family of any 11th Battalion soldiers are asked to complete our Registration form (if not already done so). Descendants name tag forms are available on the following link - Descendants/family ID name tag forms - please print (in colour) and complete as many copies as needed for your group - they are colour coded by 11Bn Company. This service is being held on the 100th anniversary of the day on which 704 men of the 11th Battalion were photographed on the Great Pyramid (Cheops) in Egypt prior to their involvement in the landing at Gallipoli. Participants and descendants or family of any of the 11th Battalion soldiers who plan to attend the Commemorative Service, will have the opportunity to participate in group photos. Descendants in particular will be asked to gather for a commemorative photo, and may also choose to have an individual or family group photo taken alongside a big Commemorative Banner of the Cheops photo. This banner will be located at the War Memorial on the north and south walls of the crypt. The War Memorial wardens and RSL WA have granted us permission to attach the banner to the crypt for this unique photo opportunity. For the descendants/family group photo, we would ask attendees to form up in a group reflecting the Company that their soldier was assigned to originally, in accordance with the diagram below. Copies of the descendants/family photos will be available in the weeks following the event. Photographs of the official event will also be available. To find your soldier, go to the: WAGS 11th Battalion website (then click on the Cheops grid or clear photo & click again to zoom).